Motorola Atrix 4G is really something amazing. From smartphone to laptop, from entertainment center to in-dash navigator, the Motorola ATRIX 4G doesn’t miss a beat. Read an email from a friend, call them to make dinner plans, get directions to the restaurant, and then watch a movie afterward – it’s all in the palm of your hand. Here’s a detailed guide of how to put your DVD movies and HD videos to Motorola Atrix 4G for watching. Motorola Atrix 4G supported video and audio formats: AAC, H.263, H.264, MP3, MPEG-4, WAV, WMA9, WMA10, XMF, AMR WB, AMR NB, WMV v10, AAC+, WMA v9. With all these supported audio and video codec, the Motorola Atrix 4G plays videos of .mp4, .mkv, .wmv. avi and .flv. For movie fans who want to watch DVD movies on Motorola Atrix 4G and convert MKV, AVI, MP4, WMV, MTS to Motorola Atrix 4G optimized videos, Pavtube Video DVD Converter Ultimate is recommended as an easy and fast tool. The software rips DVD and converts MKV, AVI, MP4, WMV, MPG, MTS, etc to Motorola Atrix 4G optimized video format with proper codec, video size, bitrate and frame rate. Tip: Get a free trial of Pavtube Video DVD Converter Ultimate here. Trial is clean and safe, with no plug-ins or ads. Step 1. Load videos/DVD to the Pavtube Video DVD to Motorola Atrix 4G Converter. Click “Add Video” button to load your various video files, such as MKV, AVI, VOB, MPG, MOV, MTS, M2TS, TiVo, and more. To rip DVD to Motorola Atrix 4G, just place DVD in optical drive and click “Load DVD”. Step 2. Select Motorola Atrix 4G supported video format for conversion. Click on “Format” bar and to select a video format that is supported by Motorola Atrix 4G. Most acceptable formats are H.264 MP4 and DivX AVI. 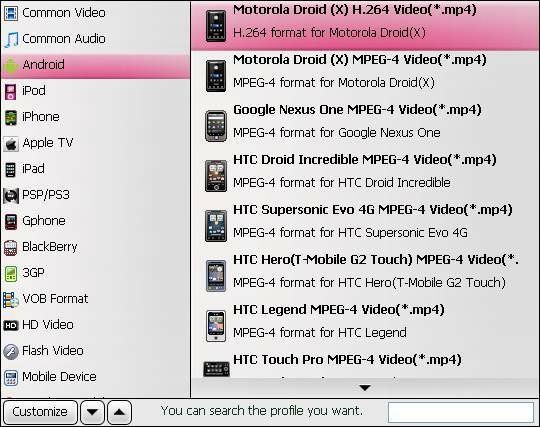 For example, you may follow "Android” and select “Motorola Droid (X) H.264 720P(*.mp4). This format shrinks a 90min DVD movie to H.264 MP4 file of around 900M. For better quality or smaller file size, you may follow “Common Video”>> “DivX AVI-Audio Video Interleave(DivX)(*.avi) or “H.264 Video (*.mp4)” and customize the format in Step 3. Step 3. Adjust resolution, bitrate, etc for Motorola Atrix 4G. Click on “Settings” and set desired size, bitrate, frame rate, sample rate, etc. To reduce video file size, set lower bitrate. To improve video quality, set higher bitrate. To get 16:9 video on Motorola Atrix 4G, set video “Size” to “1280*720” or input “850*480” in “Size” box. Step 4. Convert videos/Rip DVD to Motorola Atrix 4G supported format. Click “Convert” to start ripping DVD to Motorola Atrix 4G/converting MKV, AVI, MP4, WMV videos to Motorola Atrix 4G. The lower bitrate you set, the shorter it takes to complete the process. The Video DVD to Motorola Atrix 4G Converter never gets you involved in sync issues. Once conversion is done, you can click “Open” button to get the final output files for transferring videos to your Motorola Atrix 4G. Tip 1: The Video DVD to Motorola Atrix 4G Converter supports batch conversion and you can add multiple files into it at a time to do format conversion. Tip 2: DVD movies and HD footage can be interlaced, which contains lines on the picture. In that case please click “Edit” menu, switch to “Effect” tab, and check “Deinterlacing” box before conversion starts.